I’ve been looking over your case and, I have to tell you, I think it looks very strong. With my help, not only will you be hailed as a hero, but we’ll both get very rich. Ah, but perhaps I’m getting ahead of myself. I know there are lawyers just everywhere, so why, you might reasonably wonder, should you please hire me to be your lawyer? A lot of attorneys “specialize.” This is just lawyer-speak for “I’m only good at one thing.” Prosecution, defense, corporate, tax – I’m as skilled in every aspect of law as I am in every other; that’s my guarantee. I know a lot a tricks to get people to confess. For example, sometimes I’ll quietly mutter, “Murderersayswhat?” And then when they say, “What?” BOOM. Court adjourned. Ah, you’re saying, “Wait, trilogy? There were 6 Star Wars films, with plans for more.” Wrong. I didn’t go after Lucasfilm or Disney (because I’m not an idiot – another reason I’d make a good lawyer), but I did successfully sue my brain into erasing my awareness of the prequels. Every time I walk in to a room where you are, I will slam my briefcase down and say, “Don’t say another word!” and then make everyone else leave. I’ll never urge you take a plea. Even if there’s video footage of you on a school bus trying to sell heroin to the kids, and they offer to reduce the charge to Vending Without A Permit, I’ll insist we go to trial. You may wonder where I got my law degree. The University of Life, my friend. The University of Life. They weren’t snoring? Well, you’re no coroner! You reasonably thought they were already dead! Is it a CRIME to bludgeon a corpse? Oh, it is? No matter what you’ve been accused of, I will make you think you’re not only innocent, but a national treasure. Murdered someone in their sleep? Were they snoring? You were provoked. Dumping toxic waste in the oceans and now whales are extinct and crabs are 800 pounds? Why, you’ve ended commercial whaling AND helped solve the world hunger problem! Arguing to the Supreme Court that corporations are people and should be allowed to anonymously donate unlimited money to political campaigns? Uh… uhhhh… hm… come back to me on that one. Et sequentia. I can throw Latin terms in to conversation. I will make every dealing with me wildly exciting. If we go to trial, I’ll make sure it goes horribly up until the last minute and then POW with the surprise witness/evidence/what-have-you. I know the theme music to practically every lawyer TV show and can sing it to you on demand. Even if it’s not a court case, and you’re, say, just having me draw up a will, I’ll find a way to make it exciting. Maybe I’ll randomly leave one of your kids out of the will. Maybe I’ll stipulate that the only way to claim inheritance is to be buried with the body for 36 hours. Who knows!? Just know it will be exciting. I found a bunch of brown books that are all the same height on eBay and they should be here any day. I don’t know. Dictionaries? Catalogues? You seem very qualified, so who do I have to kill hire you as my lawyer? Also, if I do kill someone, I’d be looking at 20 to 40 years, can I pay you 1/3 of whatever I would get? Finally, how much will you charge for responding to my comment? Well, there’s my time for reading your comment… reviewing the post… of course I have to retroactively bill for the time to write the post… a couple of research lunches to determine the best avenue for responding… and writing my response… $16,000. I think you’ll find it’s worth it, though. Ouch that’s expensive… Can I hire you to help me wiggle out of this outrageous legal fee? Absolutely. You’re being gouged, there’s no question. Hell of a case, you’ve got. Hell of a case. Hot damn! I’d hire you, for sure. Just on the basis of your briefcase-slamming technique alone. Maybe you could teach me that one? I have a feeling it’d be handy around the kids…maybe my husband and I could have a full conversation again. Oh, good. 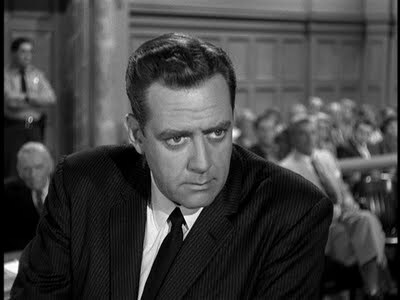 The Perry Mason caption is my favorite part, but I resigned myself that there was a good chance not one person would know what that was or what I was typing under it. Oh, I knew. I knew straight away. But I would have gone more of the “duh duh DUUUHHHH duh DUH!” route. I’ve been sitting here like a total DOOFUS for ten minutes trying to remember the theme and mouth the “buh dah BWA” to the song. Perfect fit! “Duh duh DUUUHH”? Darla, that’s simply crazy talk. you’re right, you’re right. What was I thinking? If you can assure me that the surprise witness will be Carrot Top (every time! ), you’re hired. I’d be concerned about ‘Roid Rage, but I’ll see what I can do. I’m actually IN law school, and I would hire you to be my lawyer. So you’re saying you’d like to forward this post to everyone you know in law school? Is that what you’re saying? Because if that’s what you’re saying, I’m okay with it. Clever, Byronic Man. So clever that I can see a future Hire Me column pitching your skills as a publicist. Also? I might be clairvoyant or something. Maybe you could hire me to make predictions? I spent a disturbingly long period of my life fixated with getting barrister bookcases. Can I borrow your books? 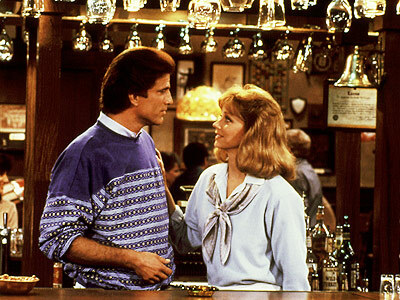 It’s true – Cheers has, arguably, the best theme of all time. Hmm, I like the Monk theme song by Randy Newman. OMG! You would be the perfect Lawyer for those 2 fellows in NJ suing Subway because the foot long sub is really only 11 inches. Can you believe the deceit? The injustice of having that other inch withheld from all those who consumed the subs. Tragic, simply tragic. I’m sure they haven’t been able to work or have sexual relations ever since they measured that sub…their lives are probably in turmoil…they need you…even without the brown books. Hahahaha! It is sad that it’s even allowed! I deal with plaintiff’s lawyers all the time. You have the qualifications. I didn’t even get in to my ability to raise one eyebrow and say, with mock confusion, “Really?” when a witness says something I think is a lie. “BOOM. Court adjourned.” Please tell me this came with festive hand gestures? I think you sound plenty qualified. Wait, you went to U of L, too? What year? I was in the Divinity program. Hey, a fellow UL’er! Gooo, fightin’ Idealists Who Eventually Are Forged Into A Life Of Acceptable Quasi-Happiness! You have great qualifications. I may need you as my tax lawyers to deal with the IRS to tel them why I have no money to pay them my back taxes. They can’t get blood from a stone, right? That’s a legal principle, right? Tell me the truth, my lawyer. I’m desperate to call you but I can’t find your 1-800-BAD (insert favorite class-action target du jour) phone number. Should I bring my own whiplash collar to the initial consultation? No need. I have a dish of them in the waiting room. 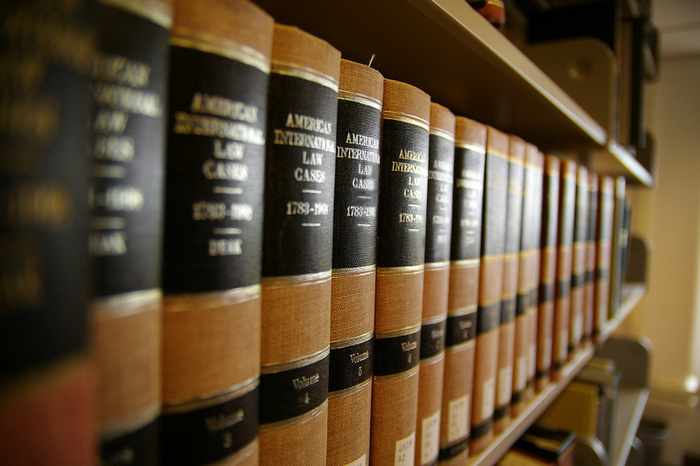 How are your legal research skills? Do you know how to use the Google yourself or will you be employing a team of associates and paralegals who bill hourly? Hourly?? How quaint. No, my team, who use a special version of Google that costs a lot of money (it’s nuclear powered and Google artisans hand-pick each search result), and we bill by 2-minute increments (including the time of the people calculating the billable dua-minutes). Sounds like a confession to me. Especially if the case involves an adulterer. I’ve also had luck with questions phrased as octuple-negatives. I’ve watched enough Law & Order to know “that’s what she said” is hearsay. Well, you make a compelling case for yourself, but I’d like to know how well-versed you are with each episode in all 20 seasons of Law and Order. I object!! And . . . I’m also suing you for copyright and trademark infringement, identity theft and plagerism!! Everyone knows that I am the ONLY lawyer out here on these bloggy interwebz and that no others are allowed to even perpetrate or insinuate that they are able to represent all of these peeps. For shame, B-man. If that even IS your real name. I’m gonna take you for all your worth. You better study up on those big brown books! Res Judicata!! Nunc Pro Tunc!! E Pluribus Unum!! How well can you ask questions you know you’re not allowed to ask and then go, “Withdrawn!!”? I took a whole class on it. But sometimes I like to keep it fresh by saying “JK!” instead. I offer a compromise position: I charge billable hours on weekends, but I don’t actually work on your case. It’s win-win! By which I mean that I win twice as much. When you enter a room, are you accompanied by the “bink bink!” sound from Law & Order? Does your voice in any way sound like Gregory Peck’s? It does in my head, anyway. That has to count for something. I object on principle. I don’t know what that means, but I’ve always wanted to type it in a blog comment. Your witness. I’ve always wanted to yell Pacino’s speech from “And Justice For All,” but the opportunity’s just never arisen. Your out of order! He’s out of order! This whole freaking comment thread is out of order! Do you offer legal advise outside the courtroom? I need someone to help me make sure I don’t innocently commit any fashion crimes. I do, but I charge extra to do the finger-snap in the air thing. The Marx Brothers mentioned a law firm called “Dewey, Cheatham and Howe” in one of their movies. Friends of yours? It’s a funny thing about lawyers – they’re essentially soldiers who fight in the legal realm. But soldiers fight for country, not for profit, a la mercenaries. Throughout history mercenaries have been a bad idea because it’s in their best interests to prolong the war in order to make more money… a problem we’ve not found a solution for in the legal realm. I’d like to hire to sue my brain into losing awareness of the Star Wars prequels as well. I’d also like to know what else you can sue my brain into not believing. Oh, lots of things. Embarrassing moments; the last few seasons of Dexter; “Gangnam Style”… it’s a big list. I’m impressed. I particularly like your brief case slamming technique. What type of brief case do you use for greatest dramatic effect. Do you prefer Samsonite? I’m imagining your brief case entirely metal and handcuffed to your wrist for intimidation’s sake. There is nothing more intimidating than a brief case chained to your wrist. Especially when used as a weapon. It’s the executive equivalent of a nunchaku. Wow, just realized I used briefcase as two words. This is why I don’t practice law. Well, I do have a special briefcase for when I have a brief case, and for when I have a lengthy one. This is funny cause I really don’t like lawyers. No, I’ll still blog; it’ll just cost $600 an hour to read it.